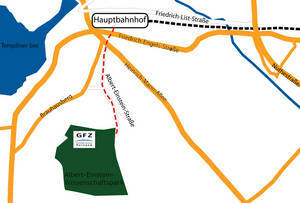 Departing from the southern side of Potsdam Hauptbahnhof (Central Station) to GFZ: Take the bus 691 directly to the "Albert Einstein - Wissenschaftspark". From inside Berlin, get a Ticket labeled "ABC" (3 Zones) and validate/stamp it (!) on the platform or in the bus. For details, see "From a Berlin Airport". From your hotel inside Potsdam, take a tram or a bus to the Central Station "Potsdam Hauptbahnhof". Nearly all buses and trams stop there. Buy a ticket of price category "A" (short distance). Then see "On Foot".